May 14, 2013 by Verle L. Bell, M.D. SO, WHAT DOES YOUR HEART THINK ABOUT THAT? What is the heart? is it about romantic feelings or feelings of rage or jealousy? David was a man after God’s own heart Acts 13,22. What does that mean? I believe that the heart is,”the chatter going on under the surface as I process what I really think” as my face is all smiles to fool those around me and often to fool myself! Of course God is not two faced, I am! With God what you see is what you get. His heart and his face always match up. That’s why he sent his son Jesus so that I could see him and know what God is really like. We are to take every thought into captivity Second Corinthians 10,5. I guess my thoughts are trying to escape and cause havoc running here and there and need to be captured. I need to listen to my heart at my self examination moments at lunch supper and bedtime. Does it match the person others think that I am? Am I thinking how lucky I am that God himself dotes on me, am I thinking how my friends family and acquaintances are so helpful kind, wise, enthusiastic, timely, organized, creative, intelligent, gifted, etc, etc? Philippians 4:8 Finally brethren whatever is good think on these things, not just on what is good about objects or events but on the specifics of what is good about people around me. When I find fault, no one ever changes. When I mull on the positives of others and then encourage them and bless them, then there is hope of influence. Not just an irritating, “God bless you” holier than you comment, but a “here is some good character I have seen in you” comment. Am I thinking that the stresses of today were prepared by my loving Lord and that it is so cool that he designed me to be the exact right one to handle them? Ephesians 2:10 When God brings an angry or needy person across my path?Do I offer a prayer of thanks,” help and show me how you want to reach out to this person through me”? What made to difference? THE CHATTER OF THE HEART FIT THEIR SURFACE STATED BELIEFS they said that the way for all men to know that we are God’s disciples is by seeing how we love the brethren,(John 13,35) and they were allowing their heart to think along those lines . God love me to be like him with a heart that lines up with what I portray to myself and others on the outside. 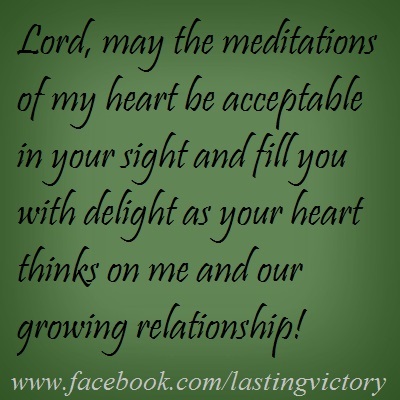 LORD MAY THE MEDITATIONS OF MY HEART BE ACCEPTABLE IN YOUR SIGHT AND FILL YOU WITH DELIGHT AS YOUR HEART THINKS ON ME AND MY HEART THINKS ON YOU AND YOUR AWSOME WAYS! This entry was posted in Uncategorized and tagged As a Man Thinketh, attitude, ATTITUDES of peace and power, BIBLE WORDS EXPLAINED, David, focus, God, HEART, THINK POSITIVE, thinking. Bookmark the permalink.